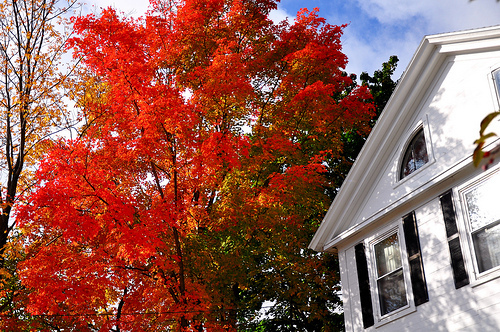 You don’t have to be a nature lover to be seduced by the splendor of Autumn foliage. It’s breathtaking from any vantage point. Earlier this week, while driving to a client I was both captivated and inspired by the landscape. While I would have preferred to be apple picking somewhere enjoying the scenery outside, I still was enthralled with the panoramic view from inside my car. That day, I was OK with the bumper to bumper traffic. It gave me time to think. I was noticing how each and every tree was morphing at a different rate of transition. Some were still green, and some only just beginning to turn to that slightly golden-kissed auburn tone. Others were completely infused with deep blood orange leaves, and still others were already shedding their leaves. At a stop light, I was struck with the sharp contrast of two adjacent trees on this particular street; one was festooned with a burst of overstuffed mango colored leaves, while it’s very neighbor was surprisingly bare, almost naked, and adorning nothing more than sparse branches. Side by side, similar trees yet so different. Both touched by nature so uniquely. It got me thinking that we too, have our own distinctive cyclical patterns. A tree sheds naturally in a very organic way, and perhaps this time of year, we can be inspired with a similar kind of change. We could all benefit from a little personal shedding and let go, don’t you think? So make like a tree and shed. Of course, on your own time, when you’re ready. Whether it be your stuff, bad behavior and routines, or people in your life…shed. It’s like peeling off a layer of dead skin, and rejuvenating with new growth. And just like a tree, you will be liberated and return back next Spring with healthy new blossom. Is it Autumn in your head? Have you “turned” over a new leaf yet?